The Romanian Association for Wind Engineering (ARIV) under the auspices of the International Association for Wind Engineering (IAWE), is pleased to invite you to join the 2nd National Conference on Wind Engineering (2NCWE) on June 6-7, 2019 in Bucharest, Romania. 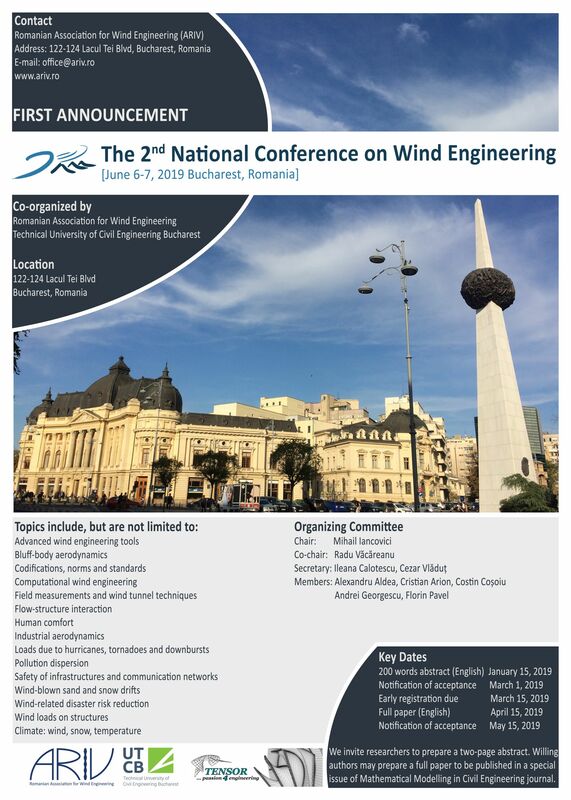 The 2nd National Conference on Wind Engineering aims to facilitate and reinforce the national and international cooperation, by promoting the latest research and applications in the vast interdisciplinary field of wind engineering ranging from wind loads on structures, the use of wind power, air quality or urban climate. The conference brings together not only researchers but also structural engineers, computational and software engineers, mechanical engineers, meteorologists and environmental engineers. As recognition of the importance of the scientific contribution of the young generation, the best student research results will be awarded by ARIV in the Wind Engineering Student Research Competition which will take place during conference. We invite academics, researchers, practitioners and students to actively participate and share their research, exchange state-of-the-art findings as well as practical applications, and to further enhance cooperation in all Wind Engineering areas. The Romanian Association for Wind Engineering and the Organizing Committee are delighted to host the 2NCWE 2019 and to undertake all the efforts to ensure its success in a friendly and pleasant atmosphere. We hope you will have a wonderful time in Bucharest in June 2019.